Bryony Clarkson, mother of eight year old leukaemia patient Scarlett, tells us about a tasty fundraising idea. 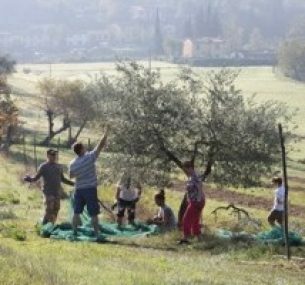 During the week of October half term, friends and family of Jane and Jeremy Blanchard gathered in the fields of their beautiful farm in Fiesole near Florence, to pick their 2012 crop of olives. Amongst them was my eight-year-old daughter Scarlett Clarkson. Scarlett was diagnosed with acute lymphoblastic leukaemia in January 2011, and is still undergoing treatment at the John Radcliffe hospital Oxford. Jane and Jeremy are neighbours here in England, and have been fantastically supportive as they have watched Scarlett go through two years of intensive chemotherapy treatment. Jane and Jeremy are selling this year’s olive oil, pressed from their fine crop of olives, with all proceeds going to Children with Cancer UK, so it was great that Scarlett was able to be there to help pick. We picked for three days solidly and then took the olives to the local press. In less than three hours, our crop had been turned into the most fabulous, bright green olive oil. It was then quickly bottled and labelled, with a special 2012 Children with Cancer UK label. There was just time for a quick sight seeing trip into Florence before the first bottles were sold at the end of season party in Italy a day later. You can’t get fresher than that! The oil was transported back to Oxford and we sold it at a special event in November. We showed a slideshow of Scarlett’s trip to Italy, and offered a tasting of our olive oil, hoping to sell out. We’re thrilled to report that the olive oil raised a fantastic £2,965. 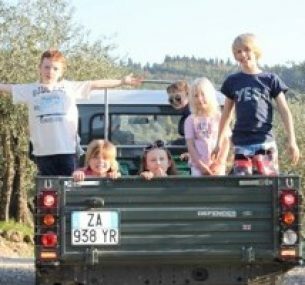 A HUGE thank you to Jane and Jeremy for a great holiday, their ongoing support of Children with Cancer UK and for coming up with such a tasty fundraising idea! We would also like to say a very big thank you to everyone who made this possible (in particular, Jeremy, Jane and the Clarkson family)… and that we have our own lovely bottle here in the office for delicious dipping sessions! Scarlett has written a special letter for our Annual Review 2012. Find out how about her treatment, her fundraising efforts and find out more about how your support is helping children with cancer.